Q: US President Donald Trump announced on June 1 at the White House that the US would withdraw from the Paris Agreement and immediately stop adhering to the emission reduction standards. What is China's comment on that? A: The Chinese side follows closely the withdrawal of the US from the Paris Agreement. The Paris Agreement is a hard-won result which represents the broadest consensus of the international community and should be cherished and upheld by all parties. The Chinese government attaches great importance to the issue of climate change, pursues innovative, coordinated, green, open and shared development, and tackles climate change with concrete policies and actions. Our achievements are for all to see. By doing so, China is fulfilling its international obligations as a major developing country and meeting the domestic requirements for sustainable growth. Going forward, China will work hard to deal with climate change, take an active part in the multilateral process on climate change, and stay committed to upholding global governance on climate change. We will work with all relevant parties to press ahead with the negotiation and implementation of the enforcement rules of the Paris Agreement, and promote green, low-carbon and sustainable growth around the world. Q: It was told at the press conference that the school bus accident taking place in Weihai on May 9 was caused by the driver who set the bus on fire. Since children from the ROK were killed in the accident, what is China's comment on this case? A: This morning, relevant departments of Weihai held a press conference on the investigation and handling of the fatal school bus fire. The public security organ confirmed based on investigation that what happened in Taojiakuang Tunnel of Weihai, Shandong Province on May 9 was an arson case. It was the driver of the bus who committed this extremely serious and violent crime which killed himself as well. 12 innocent people including children from China and the ROK lost their lives in this unfortunate incident. We are deeply shocked and saddened by that. The Chinese side hereby offers once again its deep condolences to the Chinese and ROK victims, and expresses sympathy with their families. 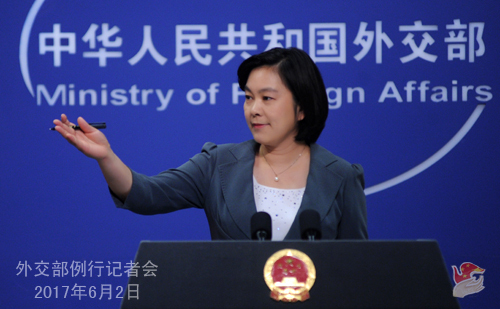 The Chinese side will continue to do all it can in dealing with follow-up matters. It is hoped that the press will report on the case in an objective and just manner, taking full account of the distress and grief of all parties especially the bereaved families. Q: I have a question about the fire at the Manila Casino which the Philippine government said was a robbery attempt. Are there any Chinese citizens among the 30 or so victims? A: The Chinese side has noted the relevant report. We mourn for the victims and express sympathy with the injured. It is believed that the Philippine side will properly handle the case. We are still trying to verify whether Chinese citizens were hurt or killed in this unfortunate incident. The Chinese side is in close communication with the Philippine side on that. Q: A UN diplomat said on June 1 that the UN Security Council is going to vote the next day on a draft resolution presented by the US about imposing new sanctions on the DPRK. Can you confirm that? What position will China take? A: On the issue of the Korean Peninsula, the Chinese side stays committed to realizing denuclearization on the Peninsula, safeguarding peace and stability of the Peninsula and resolving the issue through dialogue and consultation. There are explicit terms in the Security Council resolutions on issues concerning ballistic missile tests by the DPRK. The Security Council has recently issued a press statement on DPRK's launches using ballistic missile technologies, expressing its opposition. We have been stressing that the situation on the Peninsula is at a critical juncture. All parties concerned should exercise restraint, refrain from provoking each other or heightening regional tensions, and jointly uphold regional peace and stability. Discussions and actions by the Security Council should be conducive to that end. The Chinese side will take part in relevant discussions at the Security Council with this principle in mind. Q: I have a question about the US pulling out of the Paris Agreement. Many officials and experts said it was irresponsible for the US to do so. I wonder what China's view is on that. Does China think that was irresponsible? A: The Chinese side follows closely the withdrawal of the US from the Paris Agreement. We have noted statements made by the UNFCCC Secretariat and leaders of many countries. We believe that the Paris Agreement is a hard-won result which represents the broadest consensus of the international community and should be cherished and upheld by all parties. Q: According to his statement, President Trump believes that China is not doing enough to tackle climate change. Will China be willing to raise its climate commitment as the US requested China to do so? A: China is steadfast in tackling climate change. We have taken effective measures and achieved remarkable results. As a responsible and major developing country, China deals with climate change with concrete actions, takes an active part in global climate governance, and contributes to the conclusion and entry into force of the Paris Agreement through positive efforts. The international community speaks highly of China's leading role in pushing for the conclusion and entry into force of the agreement. As President Xi Jinping said in his speech at the United Nations Office at Geneva last January, China will continue to take steps to tackle climate change and fully honor its obligations. China is working relentlessly to limit greenhouse gas emission by 2020, and has submitted to the UN its intended nationally determined contributions by 2030. We will spare no efforts to meet those targets. Q: While pulling the US out of the Paris Agreement, President Trump also said that they will start negotiations on the rejoining of the US. Given that China has reaffirmed its commitment to the Paris Agreement, is China willing to renegotiate with the US? The US is like turning its back on over 190 signatories to the Paris Agreement. Being one of the signatories, is China still open to climate change cooperation with the US? A: We have noted the statement issued by the UNFCCC Secretariat, saying that with 194 countries having signed the agreement and 147 approved, it is not possible to renegotiate the agreement at the request of one single country. I have made clear China’s position on America’s withdrawal from the agreement. Climate change is a global issue which can be only be resolved through international cooperation. The Chinese side will follow through on innovative, coordinated, green, open and shared development in a bid to realize sustainable growth, and deal with climate change with concrete policies and actions. Meanwhile, we are ready to enhance international cooperation against climate change with countries around the world including the US to promote green, low-carbon and sustainable growth around the world. Q: China has reportedly arrested a Japanese man who is in his 60s in Liaoning Province last month. Is this true? If so, can you tell us the reason of the arrest? A: In May this year, the relevant department of China carried out, in accordance with the law, investigation into a Japanese citizen who was on suspicion of jeopardizing China’s national security, and notified the relevant Japanese consulate in China of that in accordance with the China-Japan Consular Agreement. Q: Edward Snowden told Kyodo News that the US National Security Agency has shared with the Japanese side its surveillance tool XKEYSCORE which is able to collect world-wide online data. He said that this is the beginning of a new wave of mass surveillance in Japan. What is China’s comment on that? A: We have noted the relevant report and are concerned about what was mentioned in it. 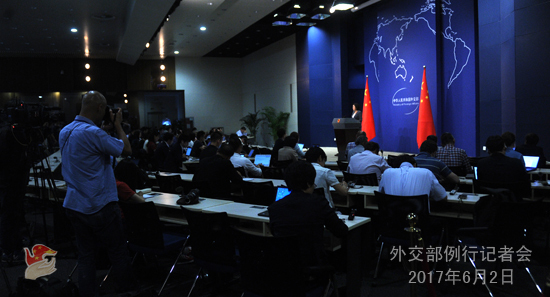 China stands firmly against all forms of cyber espionage, including mass data surveillance. The Chinese side attaches great importance to cyber security and resolutely defends its national security interests. We will continue to take measures to ensure our own cyber and information security. The cyberspace is in a mess. The Chinese side maintains that differences should be resolved through dialogue and a universally acceptable code of conduct governing the cyberspace shall be made. Q: Further to what you said about the tragedy regarding children from the ROK, what is the motive of the driver? A: That is an extremely serious and violent crime committed by an individual. The press conference held this morning by the relevant departments has given details about the case. Q: According to some Japanese media, US Acting Assistant Secretary of State Susan Thornton said that during her visit to China, the Chinese side admitted that to deal with the nuclear and missile programs of the DPRK, more sanctions are needed, and now is not the time for dialogue. Can you confirm that? A: What was reported by the Japanese media is definitely inconsistent with the fact. It seems that some people in Japan attempt to act as the spokesperson for China, but all that they said were Japan’s views. 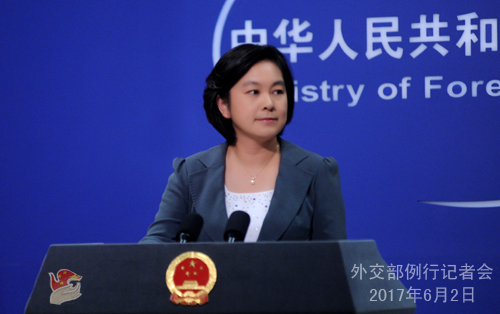 The Chinese side has stated on many occasions that given DPRK’s acceleration of nuclear and missile development, China approves of the international community’s intensified non-proliferation efforts, and that given the escalation of tensions on the Korean Peninsula, China also calls for more efforts to promote peace talks. We should place equal emphasis on non-proliferation and peace talks, so as to bring the nuclear issue on the Korean Peninsula back to the track of peaceful settlement at an early date. Q: Many leaders around the world feel that China has a special responsibility to bring DPRK's nuclear program under control. Australian Prime Minister Malcolm Turnbull, for example, has talked about how China has a greater role than others to bring the DPRK to its senses. Can you spell out what specific measures China is taking to persuade leaders like Turnbull that China is playing its role? A: It is popular among some western media and people that China has a special influence over the DPRK and should do more. I wonder whether any of them have ever looked into the evolution of the Korean nuclear issue. If they have spent some time on that, it won’t be hard for them to discover that this issue was resulted from the Cold War legacy, and the severe lack of mutual trust between the DPRK and the US and the ROK. The Chinese side always believes that the Korean Peninsula can only realize enduring peace when all parties’ legitimate security concerns are accommodated through dialogue and consultation. The Chinese side is working in that direction. As a close neighbor of the Korean Peninsula and one who cares greatly about security and stability of the Peninsula, China has been working tirelessly to bring the nuclear issue of the Peninsula back to the track of dialogue and consultation. We fully observe relevant Security Council resolutions and call on all parties to stay calm, exercise restraint and refrain from escalating tensions and provoking each other. We have been following the positive and negative developments of the situation on the Peninsula, and hope that all parties will consider seriously about China’s suspension-for-suspension proposal and parallel-track approach, and play a positive and constructive role in peacefully resolving the nuclear issue of the Korean Peninsula through dialogue and consultation. We have done our fair share and all the other parties concerned should shoulder their due responsibilities. Q: It is reported that China and the EU may issue a joint statement in support of the Paris Agreement at today’s summit. Can you elaborate on that? What measures will be taken by China and the EU to support the Paris Agreement? A: As I just said, the Chinese government attaches great importance to climate change, and will continue to take effective measures and actions to deal with climate change. We will follow through on innovative, coordinated, green, open and shared development, and undertake our due international obligations as a major developing country. We will step up cooperation with countries around the world against climate change, take an active part in climate change multilateral process, and work on the negotiation and implementation of the enforcement rules of the Paris Agreement. China is willing to enhance communication and cooperation with the EU in climate change and advance the process of multilateral governance on climate change. Q: Russian President Putin said in an interview yesterday that the China-Russia relationship is in a good state, and that Russia is ready for cooperation with China under the framework of the Belt and Road. What is China’s comment on that? A: I haven’t seen the interview but I can comment on the China-Russia relationship and the bilateral cooperation under the framework of the Belt and Road in principle. The China-Russia relationship has been developing at a high level. The two countries enjoy a high degree of mutual trust, in-depth and strong cooperation, as well as close strategic coordination in major international and regional issues. We will work with the Russian side to safeguard and advance the bilateral relationship. The Chinese side takes the Russian side as an important partner in developing the Belt and Road. Steady progress has been made in synergizing the Belt and Road Initiative and the Eurasian Economic Union. The two sides are in discussion on the agreement of economic partnership and are expected to come to an agreement soon with concrete outcomes. China and the Eurasian Economic Commission are also working on a list of cooperation projects which will serve as the guidance for cooperation between the two countries and with other countries. China’s Ministry of Commerce and Russia’s Ministry of Economic Development will study the feasibility of establishing Eurasian economic partnership, and the relevant procedure will soon be started. Russia has recently published its economic security strategy for the period until 2030, which corresponds to China’s development strategies such as the “two centenary goals”. We will work with the Russian side to enhance the complementarity of our long-term plans on development, open up new ground and cultivate new growth points for cooperation, and add fresh impetus to the comprehensive strategic partnership of coordination. Q: I have another question on the US withdrawal from the Paris Agreement, so the US is withdrawing and not fulfilling its earlier commitments for both financial and technological help. I was wondering would China be willing to do more in terms of providing assistance, for example, for less developed countries and island nations. A: Developing countries, least developed countries and small island states in particular, are vulnerable and not developed enough to deal with problems caused by climate change, and thus in need of assistance and aid by the international community. To provide financial aid for developing countries via the Green Climate Fund is the obligation of developed countries under the UNFCCC and the Paris Agreement. Developing country as it is, China, while taking actions to tackle climate change, eliminate poverty and pursue sustainable growth, assists other developing countries as its capacity allows under the framework of South-South cooperation. There will be a press briefing by Assistant Foreign Minister Li Huilai at 9 a.m. next Monday on President Xi Jinping's state visit to Kazakhstan and attendance at the 17th meeting of the Council of Heads of State of the Shanghai Cooperation Organization (SCO) and the opening ceremony of Astana Expo 2017. We welcome your attendance.